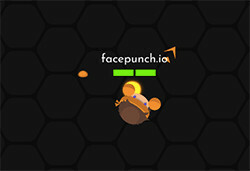 FacePunch io is a new online game developed by Clown games. It has some awesome graphics and the game is fun to play overall. If you feel bored or feel the need to let out your frustration, you should play this game. It will make your feel better and relaxed. The game app is available on both, Apple store and Google play. Basically, the main idea of the game is smashing others and collecting pieces. Enter your name or nickname to start the game. The game takes place in the black night mode. At the beginning boxer is free, but you can unlock “Foxer” by liking the Facebook page and unlock “Snowball” by subscribing to the YouTube channel. Your boxer have to wander in the setting, punch other players and knock them out of the game. Since, this is an online game other people will also attack you so your health will go down. To restore the health, collect colorful circles. The circles also give you points. A free advice: Stay away from big players as they can knock your out with a single punch. As the game is an online game, you can ask your friends to join in and play as a team. This is how you don’t need to be afraid of big players. A team can knock them out. Use the mouse of your computer or PC to control the movement of the boxer. The boxer moves in the direction you will move your mouse. Right click to punch the players. Keyboard can also be used to play this game, use space bar to punch and “W” to accelerate the boxer.